The "unzipped wall" designed by Bjarke Ingels' firm for the Serpentine Pavilion 2016 commission is set to be re-erected in Downtown Vancouver. Canadian developer Westbank, which was a major sponsor of the pavilion, revealed its plans to bring the structure to its home city exclusively to Dezeen. Danish architect Ingels also confirmed the move, and explained that the structure was purposefully designed to be easily disassembled and transported. "We knew from the start that the pavilion would be sold after it was taken down from Kensington Gardens and rebuilt elsewhere – and we also knew that we had to design, permit and deliver it in less than six months," he told Dezeen. "As a consequence the whole pavilion is conceived as an exercise in making something extraordinary out of the ordinary – and basically to create maximum variation out of a lot of identical elements." 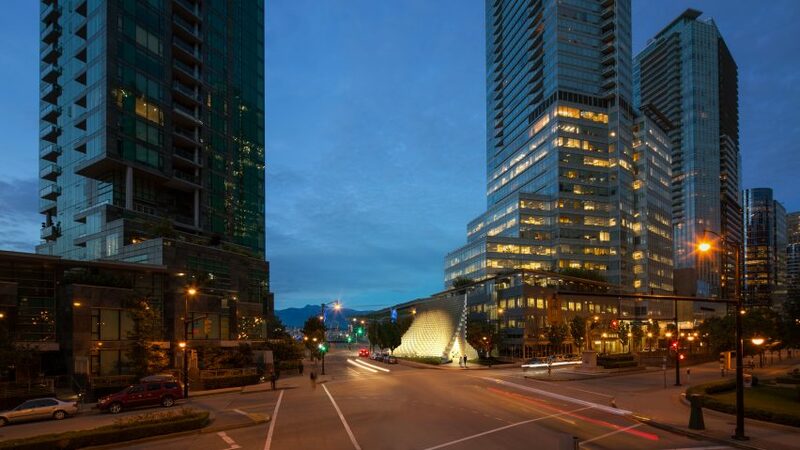 The site chosen is beside Shaw Tower – where Westbank's offices are located – in a space opposite the waterfront plaza that is home to the crystalline cauldron built for the 2010 Winter Olympics. Westbank founder Ian Gillespie has previously hinted that the pavilion could travel to several locations before its installation in Vancouver, including New York and Toronto, but told Dezeen that nothing is yet confirmed. The timeframe for the structure's permanent move is also still under discussion, but Gillespie predicted that it would be within the next couple of years. The pavilion was first installed in London's Kensington Gardens from June to October 2016. It was fabricated from 1,800 identical fibreglass boxes and bolted together using cruciform aluminium extrusions, creating what Ingels described as an unzipped wall. See how it was made in our exclusive video. "We developed an assembly method based on bolts rather than silicones or adhesives to allow for an easy assembly and disassembly of the parts," he said. Pavilions created for summer programmes or expos find various fates after the events are over. Dezeen investigated what happened to many of 2015's temporary structures after Westbank confirmed it had bought BIG's Serpentine Pavilion shortly after the opening. The annual pavilion commission by London's Serpentine Gallery has been running since 2000, and allows architects without UK projects to build in the country for the first time. Past designers include Zaha Hadid, Frank Gehry, Herzog & de Meuron and many more, all of which are described in Dezeen's series of exclusive movies documenting the programme's first 15 years. This summer's pavilion is designed by Diébédo Francis Kéré. Ingels and BIG ranked at number 2 in the inaugural Dezeen Hot List – a countdown of the year's biggest names in architecture and design. The firm and Westbank are also currently working together on a residential tower for Vancouver. The twisted skyscraper, known as Vancouver House, is underway beside a flyover that connects the downtown area to the Granville Bridge. It was named Future Project of the Year at the 2015 World Architecture Festival. Ingels added that he has grown fond of Vancouver since working there, and is happy that the pavilion has found its home there. "Nicknamed the city of glass by Douglas Coupland, its weather isn't dissimilar to that of London and its colour palette is shades of green (glass and grass) and grey (aluminium, stainless, concrete, granite and the sky)," he said. "The skyline of glass framed by the horizon of mountain tops. The rational and the organic, rectilinear and curvilinear," the architect continued. "The Serpentine [Pavilion] seems to be born from that environment – and with its new home on the waterfront overlooking the ocean inlet and the Olympic torches, I couldn't imagine a more dignified place for the pavilion to find its permanent use." In addition, the two companies are building a curvaceous skyscraper for Calgary and last year released designs for a major residential development in downtown Toronto. Along with its collaboration with BIG, Westbank has tapped Kengo Kuma to design a tower for the West Coast city. It will be the Japanese architect's first tall building in North America and is due to begin construction this year. To celebrate the project, Kuma created a tea house for a roof terrace at Shaw Tower, coinciding with an exhibition celebrating Japanese design at the neighbouring Fairmont Pacific Rim hotel earlier this year. Dezeen goes behind the scenes at the factory where the fibreglass blocks that comprise BIG's Serpentine Gallery Pavilion were made in this exclusive video.